Consider how you want to use your pool: Do you want to be able to swim laps in your pool? Are you looking to create a luxurious spot to relax? Will you spend time entertaining friends and family from the backyard? Once you decide how you’d most likely be using your pool, it makes it easier to create a design that aligns with your vision. Narrow down your must-have features: Once you know how you want to use your pool, you can expand your vision to include more specific design features. Would you like to include a spa and water features to create a relaxing atmosphere or would you rather include a slide and play area for the kids? Options like a fire pit or pool heater can give you the option to enjoy your pool year-round. Think about the logistics: It’s important to look into your local bylaws for any restrictions that you may have for building a pool. Also familiarize yourself with things in your backyard such as sunlight patterns and water drainage. Think about how you want your pool designed to make it easiest to access or convenient to entertain from. Consider including a storage area for cleaning supplies or adding an outdoor bathroom for pool guests to use. Set a budget: Setting a budget early in the design process helps you to understand any restrictions you may have while still finding ways to incorporate all the features you’d like in your design. A set budget helps keep the project on track and will make it easier for your designer to present options that are aligned with both your vision and budget. Make a sketch: When you put your ideas to paper it’ll help you visualize what changes you may like to make to your original ideas. 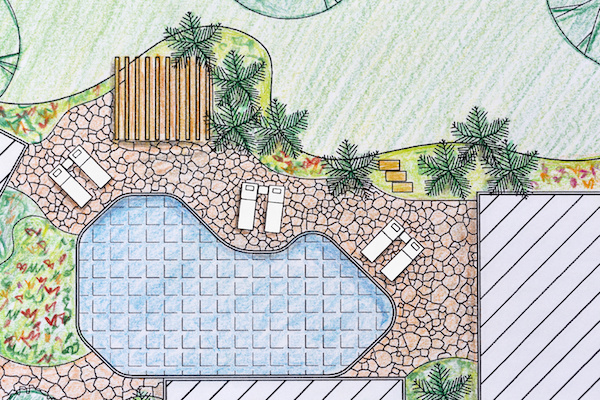 Having a sketch is also a great way to help communicate your vision to your pool designer. Look for inspiration online, in magazines, or from other pools you’ve seen. As your Melbourne pool builders, we can help bring your swimming pool dreams to life. We understand what it takes to create a pool that our customers can enjoy now and well into the future. With over 6,000 swimming pool installations under our belts, you can trust that our team has the experience and passion to help you design a pool you’ll love. Contact us today to get started!